This trip took place along the west coast of New Zealand travelling north from the Wellington district, through the Manawatu (heart standing still with fear or depressed spirit), Wanganui (a corruption of Whanganui, whanga==harbour, nui==great or many), and Taranaki (tara==peak, naki is probably ngaki==clear of vegetation) districts and then back. We have reverted to that life style that characterized earlier days that we spent in Europe--go flat out on the weekends and hope for sufficient recovery during the week to be able to make another trip on the next weekend. 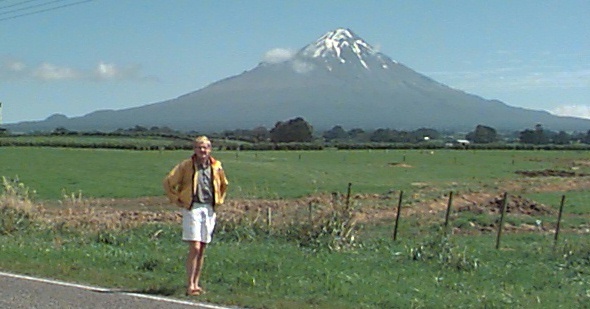 This weekend we took a trip north east from Wellington to the Mount Egmont/Taranaki region of New Zealand. Organized, as ever we left work at Poriru about 4:00 and headed north on the number one throughway expecting our early start would avoid the traffic. The throughway ended about 5 kilometers later with a traffic circle; we spent a half hour getting through that bottleneck! Another 45 minutes of 30 kph traffic and we hit another traffic jam. This time we were (fortunately) about one kilometer behind a head on collision that killed one person and injured several. This occurred on a winding piece of two lane road with no significant shoulders. The ensuing collection of emergency vehicles completely blocked the road -- apparently this is common -- and after a half hour wait we returned to Wellington for the night, arriving about 7:15. On Saturday morning we left home at 6:30. The roads were almost completely free of traffic and an hour later we were in Levin, about 75 kilometers north of Wellington. We stopped for breakfast opposite the rail station which was painted in a tartan pattern on its bottom half. Breakfast of bacon, eggs, and toast for me and a roll for Christine, with coffee for both of us, was $12 NZ. The New Zealand dollar is about the same value as the Canadian dollar and about $.70 US. Restaurant prices are all inclusive (no sales taxes and no tips). An hour later we continued on our way (breakfast was excellent) and about 10:30 we arrived in Wanganui. On the way we passed Bulls, near which is located the Royal New Zealand Air Force Museum -- need to go back there. Wanganui is about 2 1/2 hours total driving time from Wellington in good traffic conditions. The highways are generally narrow, two-laned, and very windy in hilly areas. the area from south of Levin to Bulls is a very productive, generally falt, farm area with good vegetables, fruits, berries etc. From Bulls to Wanganui, the area is more like the foothills of the Red Deer area in Alberta with rolling hills, and grain farming. The less arable land was generally devoted to sheep raising. Wanganui is a relatively large city on the banks of the Whanganui river (the spelling difference is correct). The city is at the mouth and the river extends inland for about 250 miles, most of which is navigable. It is the area in which the battles between the British and the Maori fought for possession of the land in the 1850-60's, something we will need to explore in more detail on a future trip. We had coffee in Wanganui -- barely drinkable at $2/cup. We noticed signs for a paddlewheeler excursion up the Whanganui, but had just missed it and had to push on to Mount Egmont. The drive from Wanganui, just off the coast and through towns with names such as Waverly, Patea and Hawera was delightful. The terrain was initially quite hilly and the soil was the black loam we have in northern Alberta. However the rolling hills with their grain fields soon gave way to flat very fertile fields with a heavy concentration on dairying. Herds were largely] of Holsteins and Jersey with a few Guernseys thrown in. There were also a few herds of Aberdeen Angus. 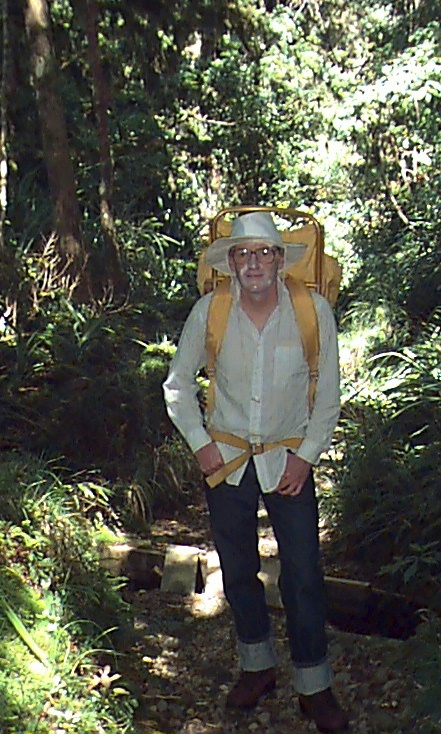 The photograph below is of Christine's trusty bearer as he trudges behind on the ascent. After descending the volcano we made our way to the coast. 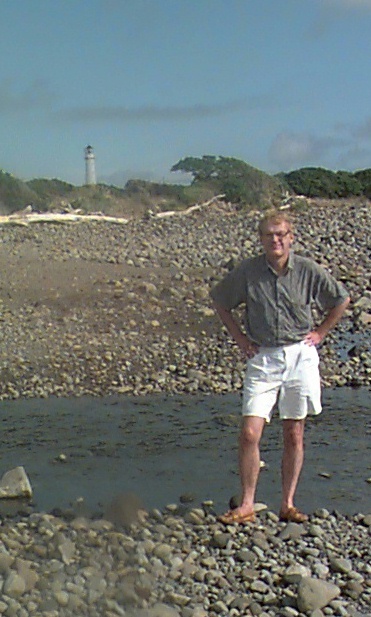 On the west most coast of New Zealand, is a cape with a picturesque lighthouse. 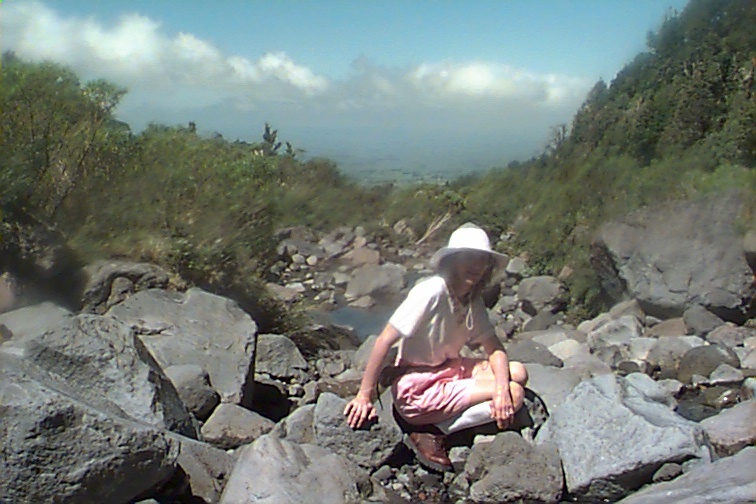 Taranaki is visible from here but is out of the angle of the photograph. The next morning at 11:00 we were back at Wanganui waiting for the boat at the Wanganui city dock. 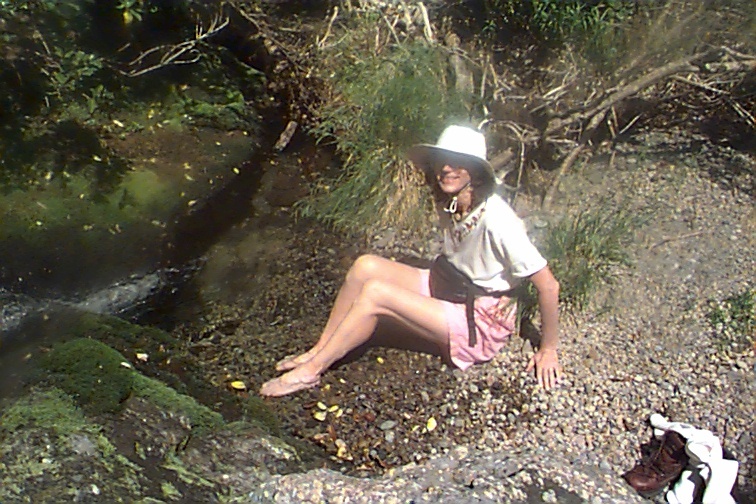 We had a delightful four hour trip (cost $20 NZ) up the river and back -- a distance of about 8 miles each way, with an hour' stay at a spot where we had lunch in a pub garden. (Charlotte the pig was in a compound next to the garden and did all the necessary recycling). I ate a lemon from the lemon tree in the garden and the locals thought I was mad. Improving on my skills I became helmsman of the Otunui. The Otunui is a 1908 diesel powered paddlewheeler. 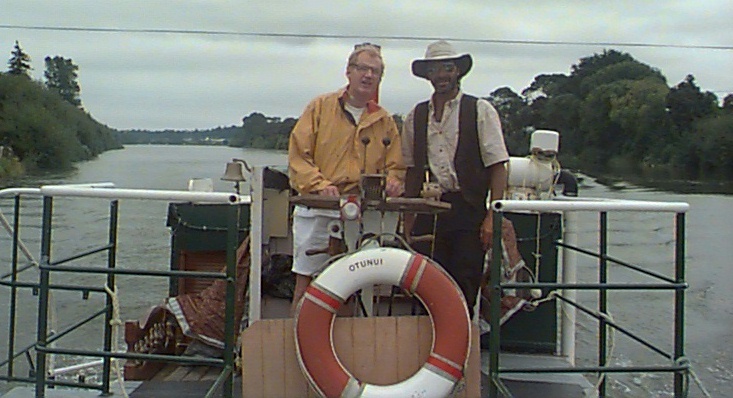 Captain Vance gave a running commentary on sites along the river, which is the historic Maori gateway to the interior. I strongly recommend the trip to any in the area.